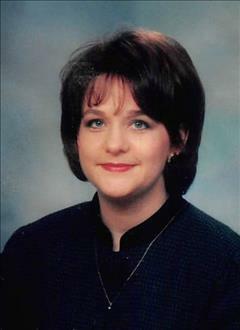 Robin Lori Cooper was born February 19th, 1964 to Robert and Jewel Benham in Holdenville, Oklahoma. Raised in Carson, Oklahoma, she attended Wetumka Public Schools graduating in 1982. During her time at Wetumka High School she enjoyed participating in band, choir, twirling, and school plays. She went on to East Central University in Ada, Oklahoma to receive a bachelor’s degree in early education with a minor in music. On July 26th, 1986, Robin married Jerry Cooper of Weleetka, Oklahoma at First Baptist Church of Wetumka. One month after marriage, they moved to Dallas, Texas where she started her teaching career at Key Elementary. She taught at Key Elementary until 1990 when she gave birth to her first son Ty Cooper and then her second son Trent Cooper in 1992. While raising her sons she enjoyed giving piano lessons in the home to children in the local community. In 1994 Robin and her family moved back to Oklahoma where they started a family farm. After two years she resumed her teaching career at Weleetka Public Schools where she taught for 17 years. While teaching she obtained her master’s degree from South Western Oklahoma State University and became Elementary principal until she retired in 2016. She took pride in teaching children throughout her career and always treated each kid in her class as if they were her own children. She was full of compassion and love and truly desired to make an impact on each and every student she taught. Robin was a faithful member of Weleetka First Baptist Church where she served the Lord playing piano during services, sponsoring youth activities, and serving on many church committees. She was drawn by the Lord and received Jesus Christ as her personal Lord and Savior on June 1st, 1975 at the age of 11 and was baptized at Carson Baptist Church. Robin loved her Lord and Savior Jesus Christ, she was a passionate prayer warrior who enjoyed living out her faith not only by her words but by her actions. One of her favorite Bible verses can be found in Proverbs 3:5-6, “Trust in the Lord with all your heart, and do not lean on your own understanding. In all your ways acknowledge Him, and He will make your paths straight.” Robin was taught by her parents at an early age to always be truthful, to always treat others as you would want to be treated, to only speak kind, positive words, and many other strong core values that would define her as someone who could be recognized as a Child of God to all who knew her. She had many quotes throughout the years, but here are a couple that she lived by: “Either you trust Him or you don’t, and I choose to trust Him.”,” Do your best, go above and beyond everything that is expected of you.”, “ In her spare time Robin loved to spend time with her family and many friends. Robin’s hobbies included reading her Bible, exercising, and serving her local community. Robin went to her Heavenly home on April 5th, 2019. Preceding her in death were both sets of grandparents, Newman and Jo Mae Benham, Louis and Mavis Sanders; and one cousin Derek Benham. She is survived by husband, Jerry Cooper of the home; sons, Ty Cooper and Trent Cooper of Weleetka and Tyler Roberts of Ada; parents, Robert and Jewel Benham of Carson; one brother, Ford Benham and wife Cindy of McCloud; aunts and uncles, Norma Withrow, Joe and Lana Benham, Claude and Pat Benham, and Steve and Bonnie Benham; cousins; Tori Nichols, Rodney Benham, Jennifer Benham, and James Benham; 11 nieces and nephews, and many other family, friends, and loved ones. Funeral services will be held on Tuesday, April 9th, 2:00 p.m. at Weleetka First Baptist Church, Robin will be buried at Carson cemetery next to her family and loved ones. She will be greatly missed, but those of us who know the Lord Jesus Christ shall see her again.